For this weeks From Page To Screen I have decided to cover Rapunzel by The Brother's Grimm. Here's a bit of back story in case some of you aren't familiar with the novel. 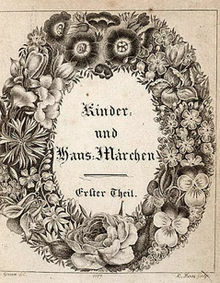 Rapunzel is a story written by The Brothers Grimm as part of a collection called Children's and Household Tales (published in 1812). The story of Rapunzel is adapted from the fairy tale Persinette by Charlotte-Rose de Caumont de La Force which was written some 200 years before the Grimm version. Rapunzel- The most beautiful girl in the entire world with long flowing golden hair. She is smart, playful and resourceful. Due to being locked away Rapunzel is also more than a bit naive. While Rapunzel longs to explore the outside world she is also a very obedient daughter and will not go against her mothers wishes. Dame Gothel- An enchantress who kidnaps Rapunzel as a baby as payback for her parents stealing flowers from her garden. Gothel is very vain and arrogant concerned more about her beauty and youth than Rapunzel's welfare. When Gothel realizes Rapunzel has healing powers she locks her away in a tower with no stairs or door in the middle of the woods where only she knows how to access her. The Prince- He finds Rapunzel trapped in the tower and figures out how to get into the tower. He falls deeply in love with Rapunzel and makes it his missions to rescue her from the Enchantress. In case some of you aren't familiar with the movie, here is a bit of back story for you. Tangled is an animated film directed by Nathan Greno and Byron Howard. It was released November 24,2010 by Walt Disney Studios. Tangled opened to mostly positive reviews and critics were quick to praise the film for getting back to Disney's animation roots. Tangled had a budget of $260 million and went on to earn over $590 million worldwide. 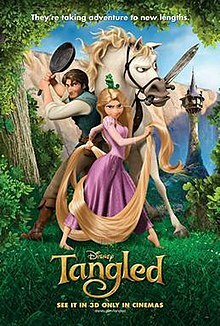 Fun facts: Tangled was originally titled Rapunzel Unbraided but decided to alter the name in order to appeal to both sexes. Tangled is also credited as Disney's 50th film. Rapunzel's parents give up Rapunzel to Gothel willingly in exchange for all the lettuce they can eat. Rapunzel is Kidnapped by Gothel. Rapunzel falls in love with a Prince. Rapunzel falls in love with a thief. Rapunzel mentions her clothing becoming tight, she later gives birth to twins. Rapunzel and the prince keep the relationship PG. Rapunzel's hair is long and beautiful but has no healing properties. Rapunzel's hair could make someone younger by singing a special song. Rapunzel's parents are poor peasants. Rapunzel's parents are royalty. After discovering Rapunzel and the prince conspiring against her, Dame Gothel cuts off Rapunzel's hair and cast her out into the world. Rapunzel is dragged back to the tower by Dame Gothel. The Prince is blinded after his eyes are poked out by thorns for "stealing" Rapunzel's innocence. Flynn is captured and imprisoned for being a thief. Dame Gothel shoves the prince off the top of the tower. Dame Gothel stabs Flynn. Dame Gothel is an enchantress. Mother Gothel has no powers. Rapunzel's tears of happiness heal the princes blinded eyes after she finds him wandering around in the desert alone. Rapunzel cries over Flynn after he is stabbed by Gothel. Her tears heal him. When the prince climbs into Rapunzel's tower she accepts him willingly. When Flynn climbs into Rapunzel's tower unannounced she hits him over the head with a frying pan and demands he tell her who he is. The above mentioned are the major differences I noticed when the book was translated From Page To Screen. Which however do I prefer?As big a fan as I am of The Grimm Brothers, Rapunzel is definitely one of their weaker stories. Where the Grimm tale focuses on obedience the Disney film is all about girl power and I like that. This weeks winner hands down is Tangled. I love the film version. I'm a huge fan of Mandy Moore and she just plays the part so beautifully. Also the animation is fantastic and really feels like Old School Disney something that had been lacking in previous films. If you haven't read the original tale I suggest doing so at least once. However, if you want the true Rapunzel experience you have my permission to skip the book and head straight for the film. This is one time where I can wholeheartedly say the film did it better. _____________________________________________Well that about wraps up this weeks From Page To Screen. Have a recommendation for an upcoming From Page To Screen, let me know in the comments below! Have you read the book or watched the film? Which did you like better? Why? Whose your favorite character from Tangled?